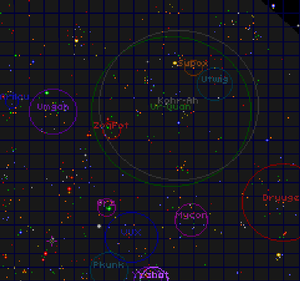 Starmap from 2158 showing Spheres of Influence. A Sphere of Influence is the area shown on the Starmap that indicates the position of a race's fleet. It can be interpreted as a border, such that Battle groups from the given race will attempt to intercept any alien vessel that crosses in. If the interloper leaves the Sphere of Influence, any pursuing battle groups will eventually break off pursuit and vanish from the tactical display1. The size of the circle is relative to the size of the fleet and will shrink if heavy losses are incurred. When a fleet is sent to war, its movement will be updated each time the Starmap is viewed. A notable example of the movement and shrinkage of Spheres of Influence is the Supox and Utwig offensive against the Kohr-Ah in which the allied fleets move southwest into Ur-Quan space and incur heavy losses before retreating to their homeworlds. During that expedition, their spheres merge and shrink. Other examples are the Pkunk migration to rejoin the Yehat, the long distance Ilwrath invasion of the Thraddash and the Mycon Birthing Fleet's voyage to implant a Deep Child beneath the crust of Organon I. After the Kohr-Ah win the Doctrinal War and begin the Death March, Spheres of Influence start disappearing as races are exterminated, starting with the Druuge (The Zoq-Fot-Pik are wiped out before the Doctrinal Conflict ends). Once a race is marched off, their sphere will disappear. 1In the game, the battlegroups may spawn anywhere within a race's sphere, not necessarily on top of a stars' gravity wells, and likewise disappear anywhere. It is unknown if this is a gameplay simplification/inaccuracy, or if the battlegroups actually return to TrueSpace and are undetectable by Hyper-Radar there. This page was last edited on 19 January 2017, at 23:13.